Drew Brees and the Saints are like a glacier. While once they struck like a thunderbolt, rolling up yards in chunks, in 2017 they’re more an inexorable force, marching forward, gobbling up yards in bites of five, seven, nine, eleven yards at a time. With a Hall of Fame quarterback under center, the Saints are content to let their two complementary backs alternately smash and slash through defenses while Brees probes for openings. This offensive approach can be stopped, but to do so an opposing defense must be just as mistake-free as Brees tends to be, never allowing free yards or easy completions. If a team is going to try to nickel and dime its way down the field, a defense must make them pay through the nose for every piece of loose change. The Packers spectacularly failed to do this to the Saints on Sunday, and no play exemplifies exactly how the Packers failed than what turned out to be a key second down play in the third quarter. Trailing by a point, the Saints were on the march and faced a 2nd-and-8 from the Packers’ 35-yard line. For whatever reason, the Packers had a complete meltdown prior to the snap, resulting in the defense looking like this just moments before Brees got the ball. The Saints picked up nine yards and a first down on an easy completion and took their first lead of the game with a field goal just a few plays later. This entire debacle followed a second quarter where the Packers allowed a rushing touchdown to Mark Ingram, which normally wouldn’t be all that notable save for the fact that the Packers had just ten defenders on the field. The entire defense seems completely out of sync and it points to the importance of one key player: Morgan Burnett. Burnett has been on the sideline for the last two weeks after leaving the Dallas game with a hamstring injury. In that stretch, the Packers have been extra giving on defense, surrendering 836 yards and 49 points. What’s more, with Burnett gone, the responsibility of wearing the radio helmet on defense has fallen to Ha Ha Clinton-Dix, perhaps leading to the sort of pre-snap communication issues we saw on Sunday. 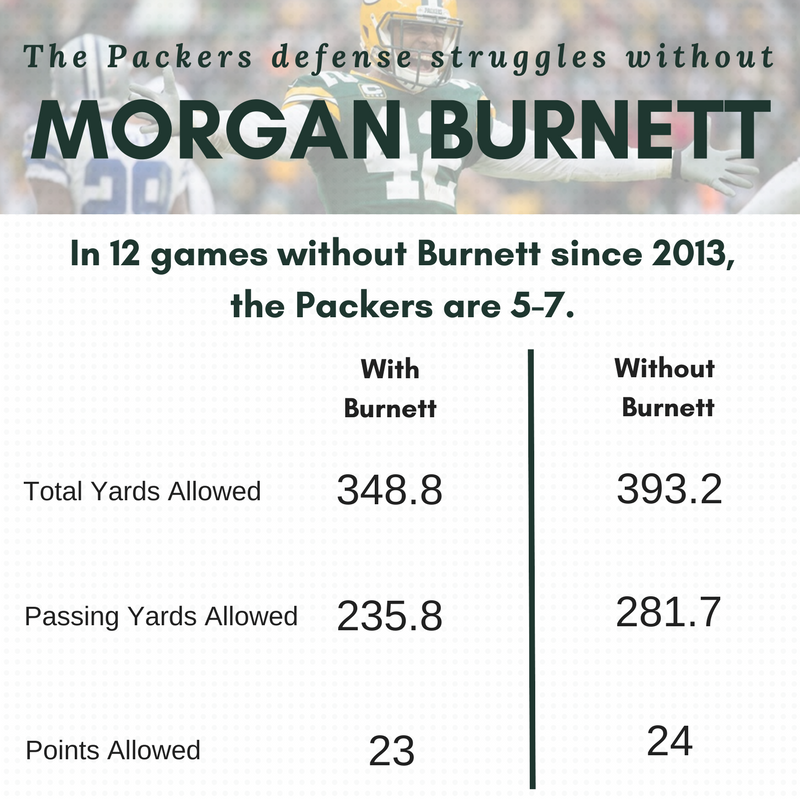 The defense’s struggles without Burnett are very much in line with what we’ve seen whenever Burnett has been absent in recent seasons. Since 2013, Burnett has been out of the lineup for 12 regular season games, and the defense has been noticeably less productive without him each time. The points may not seem all that significant, but bear in mind that the Packers have averaged 26 points during this same stretch. Giving up just one additional point per game means that opponents are always within a field goal of winning a game, and given the yardage the Packers tend to surrender without Burnett in the lineup, getting that field goal would seem a good bet for opposing offenses. What does this mean for the Packers? None of this bodes particularly well for the Packers in the short term or the long term. We don’t know much about Burnett’s hamstring injury, but what we do know doesn’t sound good. According to Michael Cohen and Tom Silverstein on the Milwaukee Journal Sentinel's Packers podcast, Burnett hasn’t been present at practice since his injury. That’s never a good indication of a player’s recovery from injury, and it would seem to indicate Burnett could be gone for some time yet. The bye week should help, but it doesn’t seem like Burnett’s return is imminent. Beyond this season, things get extra tricky. Burnett will be a free agent this offseason, with 2017 being the final year of a four-year, $24.75 million extension he signed in 2013. Burnett turns 29 in January, and normally that would mean he’s the exact wrong age for an extension. The Packers chose not to extend Josh Sitton and T.J. Lang at approximately the same age, and although their contracts surely will be richer than whatever Burnett ultimately signs, as a rule it seems like a risky proposition to extend a defensive back entering his 30s. Based on the average compensation per year, Burnett is the league’s 16th highest paid safety, and the only safety in the top 20 scheduled to be a free agent this offseason. It stands to reason that he’ll be paid handsomely in just a few short months, by the Packers or someone else. It’s not unfair to ask if the Packers will be able to afford it. The real question, though, is whether the Packers can afford to do without him. Josh Jones has been fine in a small role this season, but there’s little evidence so far to show he could undertake Burnett’s responsibilities in the secondary. There are no other contenders to Burnett’s throne as the secondary’s most indispensable player. Losing him would be a tremendous blow. Given how poorly the Packers have performed in his absence, both this season and in the past, the Packers may have no choice but to re-sign Burnett. Paying a little extra for competence in the secondary is not a terrible investment, and getting Burnett back on the field this season should show exactly why he’s worth it.